Ahh… Christmas. The time of good-will and forgiveness, of sweet-smelling pine and kiss-inducing mistletoe, of fine wines and delicious food. But let’s be honest, there are one or two REALLY annoying things about the festive season. The relatives you’ve never met, who you’re forced to give up your bed for. The shopping centres rammed with aggressive alpha shoppers, the festive tunes you can’t get out of your brain (not for lack of trying) and of course, that long dreaded office Christmas party. With Office Christmas Party coming out in cinemas on December 9th, this is the guide that those characters should have read. With Deadpool’s T.J Miller (Weasel), 22 Jump Street’s Jillian Bell (Mercedes), and Ghostbusters’ Kate McKinnon (Holtzmann) as a few of this film’s top billings, in addition to Jennifer Aniston and Jason Bateman, it’s for sure going to be the funniest movie of the christmas season. T.J Miller dressed as a dirty Santa and Kate McKinnon in the ugliest of Christmas jumpers? Sign us up! 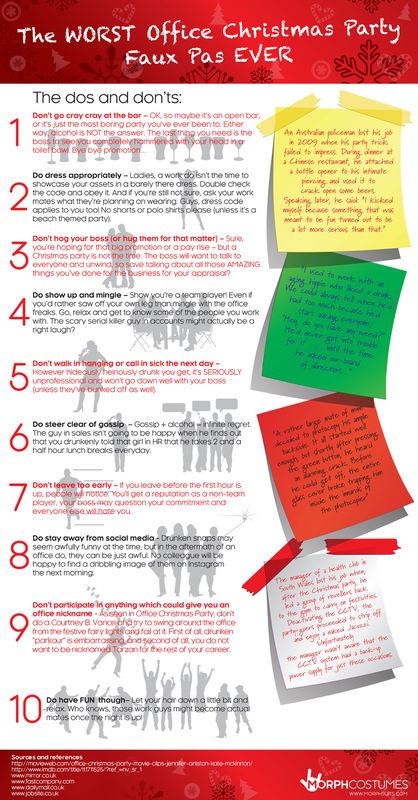 To help you survive your Xmas bash without being fired, here’s a little something to help you navigate any potential pitfalls. We also included a few funny stories from the people who didn’t follow our advice. Be warned. Add some extra fun to your Christmas Party, with a MorphCostume.